Happy and Alert at all times. They are great companions and are always wanting to love you. We are located in the upper peninsula of Michigan near Marquette. Our farm consists of 200 acres with a lake, forest, and fields to accommodate all our animals and their needs. We have Arabian horses,1 Doberman, Chinese Cresteds, and six Wirehaired Pointing Griffons as full time residents. Our numbers swell when our 'East Coast' co-breeder comes out with her 'kids'. Our children are grown, married and doing their own things. One of the main attractions is when we have puppies to play with. All of our friends with children come out and help socialize! 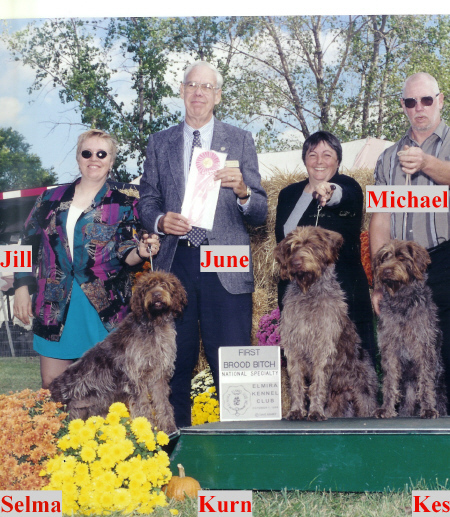 We encourage all puppy buyers and those interested in the breeds we have to come visit. If you are too far away, we do have people throughout the USA who have our four footed children and will gladly tell you about their experiences with our dogs and us. We haven't had anyone dissatisfied with our Griffs in the field. Our Cresteds are raised with the Griffs and DO NOT exhibit the "small dog scared of the world" temperament. We hope you will continue to view the rest of our site and read our contracts, deposit information and send in form, questionaire, and of course learn about our dogs. We do have cats so our pups get exposed to them and learn to leave them alone. We are committed to breeding well adjusted, happy, healthy dogs. With each new puppy buyer our family increases. We welcome your questions and if we don't know an answer, we will find out an answer for you. Unlike some Griff breeders, you will find we do not require you to do hunt tests and field trials. Though we do hope you will use the dog for a purpose -- be it hunting, therapy, hiking, companionship, or the numerous AKC/CKC/UKC events. Like children, a dog must have a job to do or they will think of something to do on their own. Here in the UP we have Northwest and Midwest airlines for shipping; but we usually have a human traveling who is willing to transport at least part of the way or all the way to our co-breeder's home in CT. We will also meet with you on the road at rest stops or safe places.